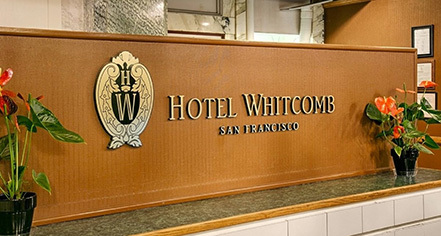 When staying at Hotel Whitcomb, the city of San Francisco is literally at one's feet. A short walk from the hotel is the Civic Center complex with city hall, the Asian Art Museum, the main Central Library and Davies Symphony Hall. The famed trolley car has a stop in front of the hotel to whisk guests away to the rest of San Francisco's landmarks. A few stops away are Union Square, Powell Street Cable Car and the Moscone Center. 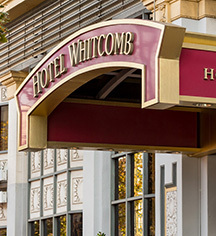 Stay on the trolley and you can go to the financial district, the Embarcadero center or and continue on to Fisherman’s Wharf where Ghirardelli Square and Cannery Row are located. Back at the hotel, have a soothing coffee drink from Starkbucks® or unwind in the hotel’s fitness center.